Do you remember Graphic Design before computers? - Burleigh Create - Creative Studio, Bristol, Graphic Design, Web design, Marketing, Mailing, Print, Printing, Digital Printing, digital media, Bristol, Portishead, Clevedon, WSM, North Somerset. Do you remember Graphic Design before computers? In the last thirty years, Graphic Design industry has been revolutionised by the desktop computers era. The impact that computers, and now even mobile phones, macs, laptops or tablets have on the industry, has completely changed not only the way designers work but also the way people explore the subject. 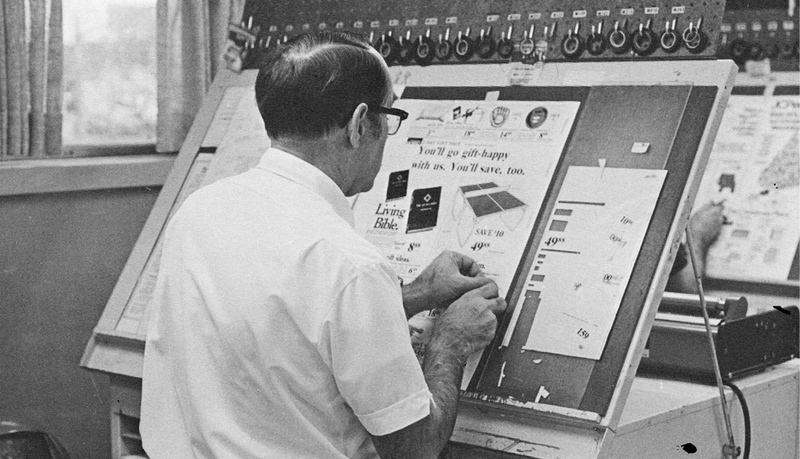 For decades before that, it was the hands of industrious workers, and various ingenious machines and tools that brought type and image together on meticulously prepared paste-up boards, before they were sent to the printer. The brilliant Graphic Means documentary explores how quickly technology transitioned throughout the 70s, 80 and 90s, and how manipulating type, photography and colour transitioned from a studio to a laptop. Check it out: https://vimeo.com/157620840 You can also visit https://www.graphicmeans.com/ to learn more about the subject. Don’t forget to follow us on twitter and facebook to get our latest updates.